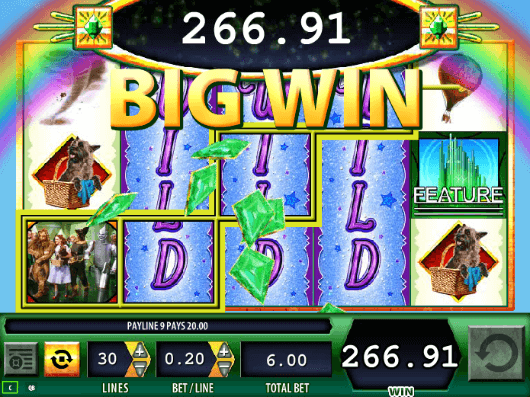 Wizard of Oz is one the most popular slots online and offline, and definitely the successful in WMS (Williams Interactive) history. Lately WMS launched two sequel Wizard of Oz slots, Ruby Slippers and Wicked Riches, but in our opinion, nothing beats the original Wizard of Oz slot machine. With all the new and shiny slots, Wizard of Oz slot machine might look a bit outdated, but you can’t not appreciate the simple & warm design, and the familiar characters from the successful Warner Bros Wizard of Oz movie (1939). Wizard of Oz logo is the Wild and it substitutes for all the regular symbols. 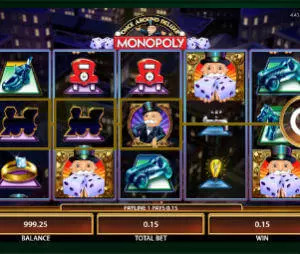 Jackpot symbol is naturally the one that activates the biggest jackpot of the game, which is worth 10,000 x your bet per line (up to $50,000). Emerald city is the scattered symbol which triggers the Bonus feature. Other high paying symbols are Dorothy and Scarecrow, Tin Man and Cowardly Lion symbol. Wizard of Oz is stacked with various bonus features: Free Spins, Expanding Wilds, Pick Me bonus and more. If you never played any of Wizard of Oz slots then it might take you few spins to get to know them all, but it’s truly worth it. This is the most frequently triggered bonus of the game. The moment Glenda the Good Witch appears anywhere on the reels, it will turn at least 1 reel wild, but it can expand to all 5 reels being wild. It rarely happens, but 3-4 wild reels is rather common. The Oz Pick bonus is basically an introduction to 2 bonus features. To get it you will need to land 3 scattered Emerald symbols on reels 1, 3 and 5. Then you will be requested to choose between the Flying Monkeys bonus and Emerald City bonus. Similar to many WMS slots, Wizard of Oz has 2 control panel options: Classic and Quick Bet. Using the Quick Bet panel the number of lines is fixed on 30. You just need to choose how much you wish to bet per line and hit spin. Classic panel allows you to control both: the bet per line and the number of active lines, from 1 to 30. To switch between the panels just click on the small C or QB buttons at the bottom left corner. Other buttons (from left to right) are Paytable, Auto spin and Spin. One of best slots online and offline. If you haven’t played, I truly recommend you give it a try.